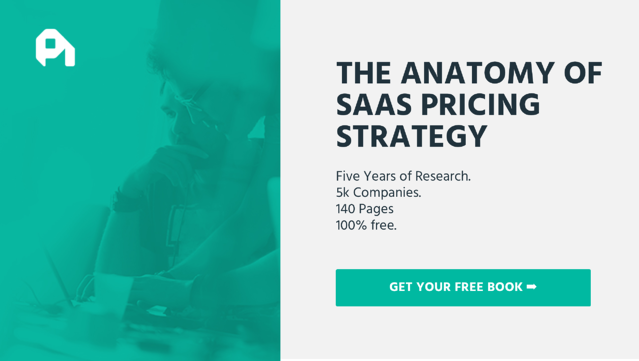 To get people into their product, many SaaS companies turn to discounts to increase acquisition. They think that they can raise prices later, once these customers see the value in the product. But by discounting, you have already hurt that value. 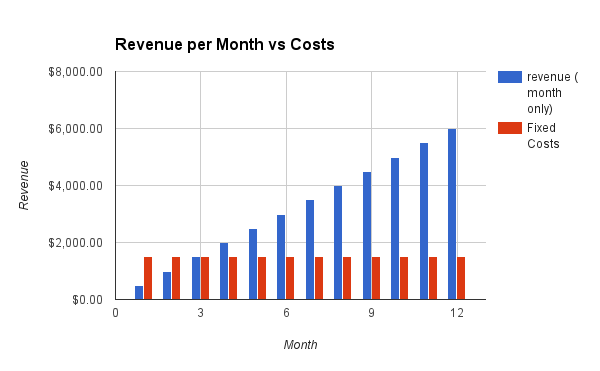 Throughout this series, we've discussed how pricing is a dedicated and patient process. After spending so much time perfecting your pricing, you shouldn't use discounting as a “quick fix” to bring in more customers by underselling the value of your product. Let's walk through why this is so painful from a data perspective, as well as how you should use discounts if you need to use them. In retail, providing discounts works to bring in more business because brands can limit supply. In SaaS however, customers are constantly presented with so many promotions and discounts that if you offer a discount “for two days only,” they know there will be more coming down the pipeline. 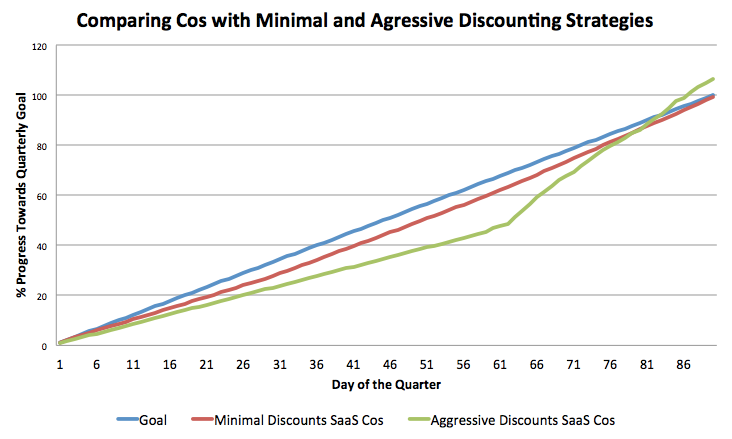 To look into the effect of different discounting strategies, we compared data from 88 SaaS companies (55 for minimal and 33 for aggressive) and tracked progress towards meeting their goal over the course of a quarter. Throughout the quarter, the minimal group remained close to the anticipated goal while the aggressive group lagged further and further behind until the last couple of weeks. At this point to make sure they hit their quarterly goal, the sales team would start to use discounting aggressively. When just looking at the goal, it seems that the aggressive strategy may be the better choice as they exceeded the goal in the end. However, limiting our view to only this small window of time means we miss the significant repercussions of such an aggressive discount strategy further down the line. We looked deeper into the metrics to see how each strategy affected the companies over time. Lower willingness to pay. Their price threshold is already set so low so when the price is brought back up, they have a higher price sensitivity and are less likely to renew. High churn rate. Following the rise in price, rather than renewing, customers are more likely to churn out and look for a cheaper alternative. Lower lifetime value (LTV). With so many customers that don't renew, you're losing out on that investment you've made to acquire them without even experiencing any revenue. By offering an aggressive discount without having the proper retention strategies in place, businesses are seeing high turnover rates and loss in revenue. Companies often offer discounts thinking that it will help with cash flow by increasing acquisition of customers. However in the long term, it ends up hurting you instead as you have to spend longer recovering CAC which is even higher with the increase in customers. To compare how detrimental discounts can be on CAC, we looked at the impact a 20% discount, one of the most common discounts, could have on a $500/m customer that costs $6000 to acquire. The 20% discount takes your customer's MRR down to $400 and raises the time to recover customer acquisition cost (CAC) by 3 months. That's pretty significant, especially considering that we already know that churn rates are even higher for discount customers. Even if the discount brings in more business initially, you may never end up recovering CAC for these discount customers and ending up losing even more money in the end. While discounting directly affects your actual revenue, it also kills your momentum as a company by training both your customers and your team to devalue your product. Your customers don't think it's worth it. By offering the same product at a discount, your potential customers may not think your product is worth your original price. Your sales teams just want to close. They may be using discounts as the path of least resistance to close a sale, diminishing the culture of profit you want to center your company on. Not properly valuing your product can cause profits to leak out of the discount faucet at a flood-like rate before you even have a chance to notice they're gone. Be discrete. Don't broadcast to everyone that you're offering the same product at a lower price. Those paying the full price may feel undervalued. Segment discounts. Only target those who need the extra push to close the deal. Don't offer to those who are willing to pay the full price or you'll miss out on those opportunities. Limit in scope and time. The point of a discount is to lower the initial activation energy needed for someone to close, but then your product should convince them that the full price is worth it. By only offering the discount for a certain time, you'll add in that sense of urgency to make customers feel the need to buy now. Vary your offers. Making your offers predictable will cause customers to expect it and wait for the discount to go live rather than pay the full price now. If you do decide to offer a discount, you can maximize your initial returns by offering the discount on your annual plan. Annual plans are a great way to get cash upfront, especially important for new bootstrapping SaaS companies. 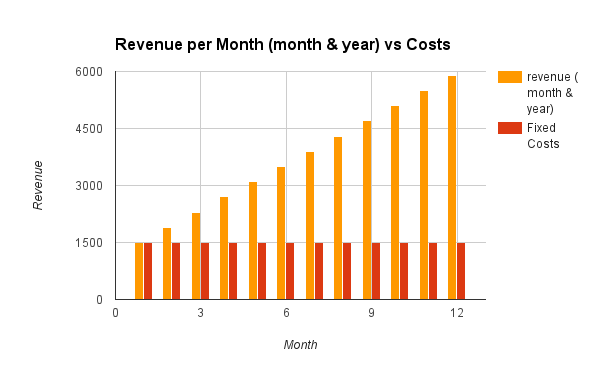 Assuming a company has $1500 of fixed costs a month, we see that it takes the company at least 4 months to start making a profit. Compare this to the company offering annual subscriptions. We see that the company would break even within the first month and start making profits much faster than if only the monthly plan was available. Compared to a monthly subscription, having an annual plan gives you more money to invest in your business and grow it through the year rather than waiting for each month to pass for more cash. By offering a discount on your yearly plan, but not your monthly, you can convert more customers to potentially stick around for longer, and it gives you an increased cash flow at the beginning of the year. Even just 10% of customers signing up for a discounted yearly plan can make a massive difference in your revenue. When used correctly, discounting can give customers that extra push needed to convert, but it should be used as more of a secret weapon, rather than the first resort, whenever a deal needs closing.